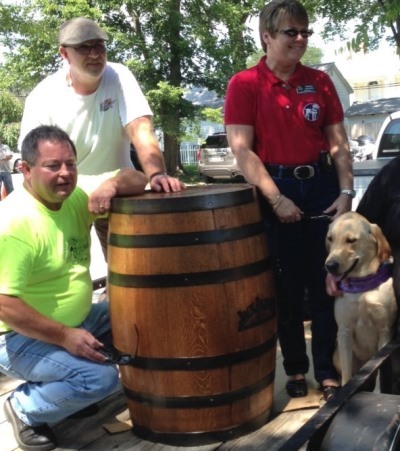 Among the items auctioned off at the 2014 Tennessee Hawgs for Dogs event was a Jack Daniels whiskey barrel. From left, District 711 Business Representative Tim Wright, Local 1501 President Paul Buckner, GDA Volunteer Teresa Blevins, and Asia. Also auctioned was a unique handmade quilt made by IAM members Angela Duren and Paula Skelton. More than four dozen motorcycle riders kicked off this year’s annual Tennessee Hawgs for Dogs ride to benefit Guide Dogs of America (GDA). The day-long event, which raised more than $6,000 for the IAM’s favorite charity, was organized and hosted by volunteers from District 711 and Tullahoma, TN Local 1501. In addition to rider’s entry fees, the event raised money for GDA with auctions for collectable items that included a Jack Daniels barrel (was it full?) 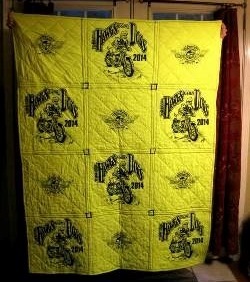 and a one-of-a-kind quilt made from Hawgs for Dogs T-shirts by IAM members Angela Duren and Paula Skelton. GDA receives approximately 50 percent of its yearly budget through IAM fundraisers such as the Tennessee Hawgs for Dogs event and uses the money to graduate between 50-60 guide teams each year. It cost approximately $42,000 to successfully breed, raise and train the guide-team to graduation. GDA also provides a lifetime of aftercare beyond graduation, at no cost to the blind and visually impaired recipient.